The Macron is a modern, all-seater stadium with a capacity of 28,723 which was completed in 1997, replacing the club's old ground, Burnden Park. Despite the improved facilities and larger capacity (and resultant larger ticket revenues), this move was unpopular with many of the club's fans. Most new grounds tend to be unpopular at first however and in recent years it's been much more appreciated. There are no bad views within the stadium and all seats have unrestricted views. Up to 5,000 visiting supporters can be accommodated and are allocated the South Stand behind one of the goals. 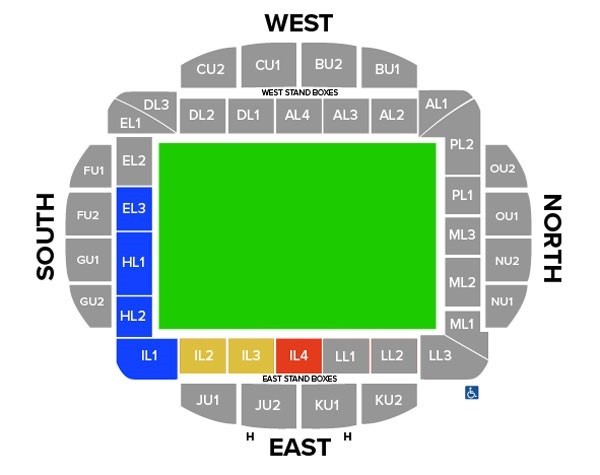 Generally, the allocation is nearer 3,000 however and when this amount is taken the lower tier can be shared with home fans The upper tier however, is reserved for away fans. The leg room and facilities within this stand are very good and the view is fantastic. The Beehive is located on Chorley New Road, with the advantage of fans being able to park their cars there for £5 and claim the monies against drinks at the bar. The Macron Stadium is located on the Middlebrook Retail Park which has plenty of fast food outlets including a Nandos, Burger King, Pizza Hut, a BWFC themed McDonalds and several other themed restaurants. Parking is freely available at the stadium at a cost of £6 per car. It is advisable to leave your car here in the secured car parks as there's little parking in surrounding areas. However, if you are determined to park on the roads to save a few quid, try parking at the Beehive pub which is on the roundabout (half a mile past the stadium coming from the motorway) where you pay £5 per car but get it all back at the bar. The nearest / closest train station to Bolton Wanderers's Macron Stadium is the Horwich Parkway train station which is just 100 yards away. It is situated on the Manchester Airport to Preston and Blackpool North/Blackpool North and Preston to Manchester Airport line. Travel: I travelled by car and there was ample parking, free if you look close to ground or £ 3-5 pounds in a "football car park". Refreshments: There were 3 or 4 close to the ground. The Beehive is a 10 minute walk from the ground and away fans are welcome. There are loads of eating places right next to ground like KFC, Burger King, SubWay etc. Impressions: 'MAGNIFICENT'. This new, modern, futuristic ground has lots of space, good food and the toilet facilities are first class. Facilities: These are 1st class. There is plenty of leg room and the ground was spotless. There is not a bad view in the ground. Exit: It is easy to get out of the ground but driving can take up to 40 minutes to get off the grounds and on to the motorway. However, away fans coaches are given priority and can be away within 10 minutes after the game. Enjoy: Absolutely, it's a must see for any football fan. 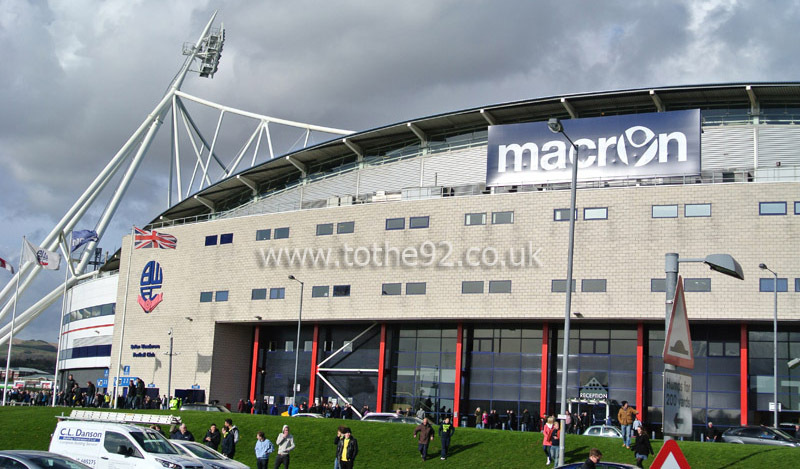 Have you been to Bolton Wanderers's Macron Stadium? To tell us about your experiences and to feature on the site, simply complete the fans review form below! Submit Your Ground Review Here!